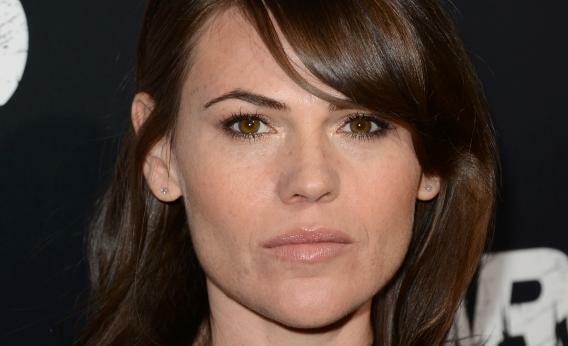 Clea DuVall in Argo and American Horror Story: so glad she's back. Clea DuVall at the premiere of Argo in Beverly Hills, Calif.
For a brief moment in 1999, Clea DuVall was everywhere. She was a mean girl with an actual edge in She’s All That. She was a troubled teen alongside Angelina Jolie and Winona Ryder in Girl, Interrupted. And in perhaps my favorite of her performances, she seduced Natasha Lyonne at a gay reeducation camp run by Mink Stole and RuPaul in the delightfully bizarre comedy But I’m a Cheerleader. In all those roles, DuVall embodied the sensuality and capacity for pain that real teenagers are capable of inflicting. But that talent never quite translated into the high-profile career I’ve long thought DuVall deserved. She worked, starring in HBO’s Carnivàle and nabbing an unsettling bit part in David Fincher’s Zodiac. She spent a lot of time doing one-off appearances on network television and making TV movies. So I’m thrilled that Duvall seems to be finding a place for herself as an excellent character actor. Ben Affleck cast her in Argo as Cora Lijek, the wife of Mark, a consular officer in America’s embassy in Iran. The movie focuses more on Affleck’s performance as CIA officer Tony Mendez than on the escapees themselves, but DuVall and Christopher Denham, who plays Cora’s husband Mark, have a nice affection between them amid all the tension. And DuVall’s even better in American Horror Story: Asylum, which tapped her to play Wendy, the schoolteacher lover of Sarah Paulson’s journalist character, Lana Winters. Their relationship is tender and supportive, but as becomes clear in upcoming episodes, they’re living in a deeply homophobic environment. “I’m practically family. We’re very close. Like sisters,” Wendy tells a visitor in an upcoming episode, struggling for language that can capture their closeness without exposing Lana as a lesbian. Where DuVall often played strong, even aggressive characters in the past, in both American Horror Story and Argo, she’s turned in good performances by playing deeply vulnerable people trying to be strong in threatening circumstances. As someone who lived out an awkward adolescence at the same time DuVall was acting her way through one on-screen, it’s exciting to see her finally getting a chance to be the nuanced, fascinating character actress she was all along, but now as an adult.